When semi-son Mark told us he was coming home for his final school break, we were quite pleased. You know, Spring break ... college ... Florida. He wanted to cook a special meal at home for us; so, we spent Wednesday at the West Side Market, shopping for his dinner -- leg of lamb, fresh white and green asparagus, roasted fingerling potatoes. We asked him about dessert. He said the only thing that he wanted for the special evening was a dessert that Stacey came up with when the boys were small, Chocolate Gooky, which was easy and fun to make. Chocolate Gooky? Yeah, "gooky" or "gookie" (British sp.) is defined as anything that you don't want to take the time to describe in detail, e.g., "Pick up that gooky on the floor." Beware! This feeds about 20. 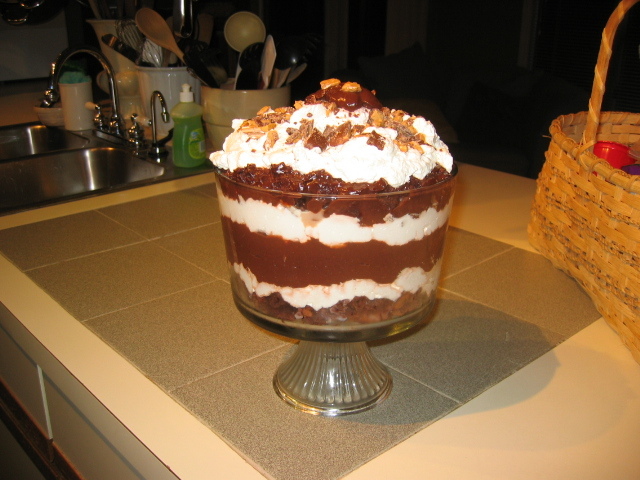 In a trifle bowl or some other tall container, break up some brownies and layer the bottom of the bowl. Spoon in Cool Whip and smooth out to cover the brownie layer. Carefully pour in pudding to make another layer. Break up 4 of the Heath bars and spread on the top of the pudding layer. Spoon on another layer of Cool Whip. Add some broken up brownies on top of the Cool Whip layer and cover with pudding. Top off with Cool Whip. Break up 2 Heath bars and spread on top. Refrigerate. We substituted whipped cream for the Cool Whip. Beat some marshmallow creme into the whipped cream so the whipped cream doesn't break apart. Or -- use macaroons broken up instead of the brownies. Substitute vanilla for chocolate pudding. Toast coconut and substitute for the Heath bars. Or -- use madelines (costco has some nice madelines) instead of the brownies / macaroons. Substitute lemon curd for the chocolate / vanilla pudding. top with madeline crumbs. To die for. I had to laugh at 'health bars'! Sounds as good as it looks and I think I am going to forgo any healthy habits for a weekend and make myself some Gooky. You have such a wonderful sense of "family" and I can always imagine beautiful smells coming from the kitchen, love and laughter filling the house, dogs excited, wine corks popping, lots of teasing. I know it is not just an image in my head. I know that is the type of home you have because you and Stacey are such wonderful people and wonderful parents. wow. thanks, michelle. it IS kind of crazy over here. we'd love to cook for you. btw, bill: i don't care if it IS british! it's spelled "GOOKIE," dammit! lol, anji! "health" bars. as if.